Backlink Checker is website back link status-checking utility that enables to monitor the back links of the websites for the popularity on the World Wide Web. Link checking utility checks the status of back links also known as inbound link, incoming link or inward link to your websites and monitors the link status of advertiser site to the publisher sites. If the back links of advertiser site is not found or page cannot be displayed on publisher site then back linker checker sends an alert notification by sending E-Mail informing the user about the non-availability of website link. Software is capable to detect user’s websites links including java script link, link on publisher’s website etc. Link checker utility generates the report in TXT or CSV file format for further reference. » Software checks the back link of the websites in real time. 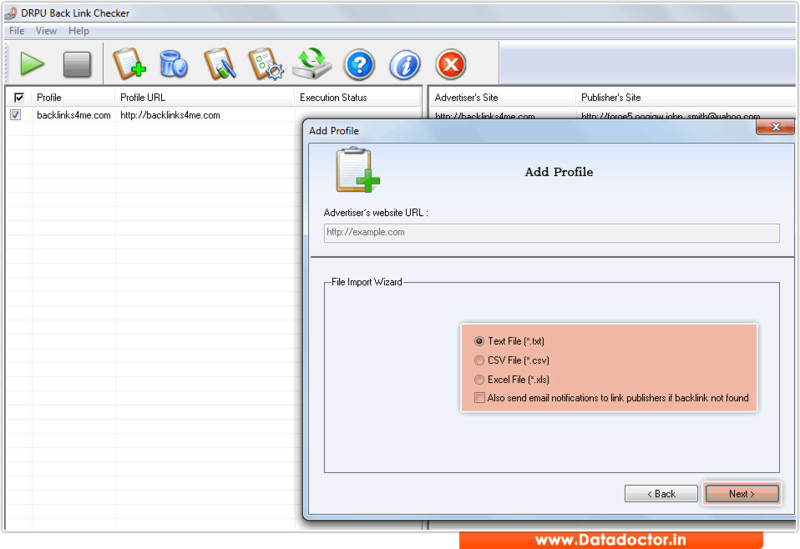 » Monitors the back link status of advertiser sites on the publisher sites. » Sends an alert notification to user if user web site link is not found on the publisher site. » Software generates the report of total number of links status in text or html format for future use. » Helpful for business purpose by checking the status of web sites.